Well, here we are!! SO close to the end and I can hardly believe it. Here's a THIRTY-NINE week bump update! 39 weeks! And anxiously awaiting the babe's arrival! Just about DONE! All I need is a white nightstand (which I will probably order online) and to hang the rest of the wall decor... I need to find an hour or two to knock it out, and we can call it "officially" complete! The sweet baby's arrival. It's about the only thing on my mind these days! Oh, yes. To be honest, my belly has gotten so big that the majority of my maternity clothes are getting a little too short around the bottom of my belly. I've resolved that with only a week left I will not buy any more clothes, but I really am struggling. I have been rotating the same 3 outfits for the last 2 weeks, ha. Oh man, the burn... I had unbearable heartburn for 3-4 days, and I felt like I was going to die. Seriously, I had to compose myself a few times to make sure I didn't throw up - it was bad!! Thankfully it has gone away, and I hope it never comes back (I will never eat supreme pizza again... just kidding, I probably will - just not for the remainder of this pregnancy). Actually, my sleep isn't too bad. I wake up 2-3 times to use the restroom, but that is a HUGE improvement from the hourly routine I was on before. Although I am not getting up as much, I am a total zombie between 4-5AM and cannot fall asleep. Full force!! I've realized that I cannot get everything done on my list by myself (while staying sane...), so we hired someone to clean our carpets and clean our window last week (oh my goodness - I will be doing this at least yearly) and we hired someone to clean our house yesterday. It was the first time having ever paid for a house cleaner, and it was pretty fabulous. Two ladies were here for a total of 3 hours and I can't even believe how much they accomplished - baseboards, blinds, fans - yes, yes, yes! We've had a little issue with Scout digging under our fence, and John was able to install an electric fence this weekend (which was a huge check on "my" nesting to-do list) - that man has worked so much lately, and I am so thankful for him. All of the other things on my list can be done once the baby arrives... replace burned out light bulbs, change air filters, trim bushes, etc... so if these things don't get done, I really can't complain too much! I miss not totally struggling putting on pants, reaching my toes, and I miss standing up easily after laying down... my belly is just getting so big that it is in the way and I am constantly forgetting how large it is when walking through doors, turning around, etc. It is kind of funny and kind of just ridiculous how much stuff I keep bumping with my bump! I know pregnancy is to be celebrated and losing the baby weight takes time, but I am certainly looking forward to losing some of this weight (just being honest!). Honestly, nothing really! There are still a few house things that I would love done, but as far as the baby goes, we really are able to relax. All of the baby gear is assembled, registered and put away. I've purchased all of the postpartum must-haves, we have loads of toilet paper, paper plates, plastic silverware... my nails and toes are painted and I have a fresh set of highlights! The car seat is installed and my hospital bag is in the trunk of my car. And now, we wait... we are ready for you sweet baby! John and I have been so busy lately that I haven't had any time to sit down and write a blog post. Here's a quick peek of all that we've been up to! Normally I like to lounge around the house on Saturday mornings, but lately I have been wanting to get up and start the day since our to-do list is so long. We started our morning with breakfast at Down on Grayson, and a little farmer's market action at the Pearl... not too shabby, if you ask me! We've been working to get Lily exposed to gunfire to get her ready for this fall's hunting season. We drove up to Austin and started her on some birds... and man, she is an athletic little puppy! We need to get her out one or two more times before she is ready to go hunting with Scout, but she is doing very well so far. Our little outing was the perfect excuse to work on my DSLR camera skills before baby Pray's arrival. Any reason I can get...! And Scout, of course, had to get in on all of the bird training action... showing her sister how it's done! Normally I go for neutral colors on my fingernails, but I couldn't help but celebrate fall with something a little darker. I took it off as soon as it started to chip, but it was still festive while it lasted. The weather has (very) slowly but surely been cooling down (and by cooling down, I mean high 80s...), so John took advantage of a nice afternoon and went for a mountain bike ride at Flat Rock Ranch in Comfort, Texas. A couple weeks ago my dad came down to Texas from Minnesota to help finish baby Pray's nursery. And boy, oh boy, his execution of our board and batten idea was way better than ours ever would have been - complete with engineering drawings and everything! And we've got ourself a board and batten!! My contribution to the weekend? Well, not a whole lot other than providing my opinions and baking cupcakes - but hey... at 37 weeks pregnant, I didn't mind! Even more than my dad's help, it was so nice to see him and have family around for the last bit of my pregnancy! I could not be any happier with how the nursery turned out... I will have a full nursery post soon since we finally have furniture in it! We have textured walls, so I was insistent that hardboard be hung behind the battens to remove the texture - and it turned out amazing! I've been participating in a weekly women's Bible study with my church on 1 Peter; it is a 9 week study, and we just finished the 7th week. It has been such a fun way to count down the final weeks of my pregnancy while forcing myself to stay disciplined in the Word. The ladies participating in the study had a celebration for baby Pray and me - it was such a sweet time, and was so incredibly thoughtful of them! Complete with punch, cake, a monogrammed burp cloth, and the sweetest card... I felt so cared for and thankful for God providing for me with this close to my pregnancy! John and I have been on the hunt for white nursery furniture, and we thought that IKEA would be our golden ticket - WRONG. The only good that came from the trip was cinnamon rolls... (which, I admit, were indeed delicious). I don't know, IKEA just doesn't do it for me anymore, and I honestly never want to go back. We drove two hours to get there and they didn't have any of the items we wanted in stock due all of their recent recalls. The items they did have were in "white" which is actually off-white (not to be confused with "white stain" which is actually white) - confusing, I know. But after searching, and searching, and searching, and calling and visiting 20+ furniture stores, we were finally able to find the perfect dresser!! My husband was such a trooper - he worked the whole weekend prior putting together the nursery, and literally, the only thing we did the following weekend was drive around and look for dressers because I insisted it needed to be bright white and I wanted to take it home that day... it doesn't seem like a tall order, but apparently it is?? He threw that dresser in the truck and was happier than I was to have it be finished! This past weekend I met some girlfriends to get manicures and pedicures before the baby's arrival. My friend Jessica has the exact same due date as me (how fun is that?!) so she is counting down the days as well. I am officially in the home stretch of baby-growing, and it is crazy to think that baby Pray could be making his grand entrance within the next couple of weeks. Things have been slowing down at work as I'm handing off projects, and I am enjoying being able to relax a little bit more while waiting for the sweet babe's arrival. 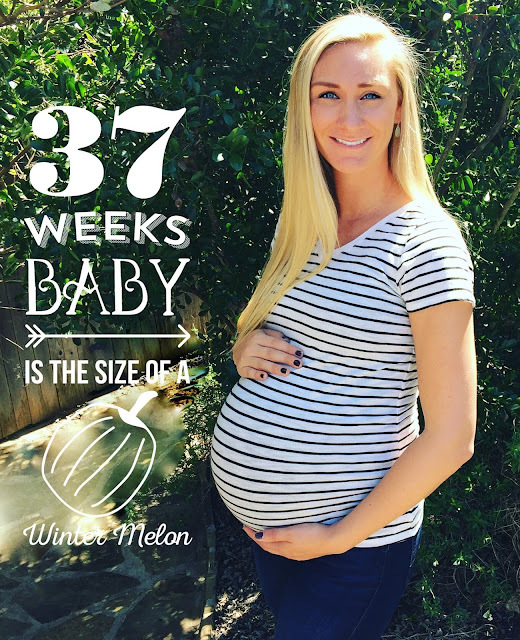 Here's a quick 37 week bump update! 37 weeks - only 3ish weeks to go! According to my What to Expect app, the baby is 19-22 inches long and weighs 6.5lbs. At my last appointment my doctor said that we have a very "solid" baby on our hands. Honestly, this did not surprise me all that much since I was 8lbs 10oz and John was 9lb at birth... so "solid" was something I had expected! My dad came to Texas this past weekend, and he and John worked non-stop on the nursery. I keep joking and saying that the baby will love it; but let's be real, I LOVE it! And trust me, you cannot fully appreciate the progress of this nursery without knowing where it started... dark gray walls and ceiling, stickers on the wall - it was no bueno! We still need another coat of paint, but hopefully we can get it done and the furniture moved in this weekend. The arrival of the baby! It seems so soon, but also like time is moving so slowly at the same time! I'm also looking forward to this weekend - I'm thinking a movie on Friday, a trip to Austin on Saturday, with a little bit of IKEA thrown in to finish up the nursery! Honestly, nothing out of the 37-week-it-is-almost-time-for-a-baby ordinary! Swelling around my feet and ankles at the end of the day, but nothing too much other than that. Oh man... it will be heaven when I can sleep on my back again!! I had a super terrible week of sleep a couple of weeks ago, and I kept waking up with sore hips. Not only that, but I was a total insomniac from about 4-5AM. John suggested I adjust my sleep number (to something firmer with more support), and ta da... it helped wonderfully! I am still so looking forward to sleeping on my back, but thankfully my current sleep situation isn't too bad right now. Oh yes, but the baby is certainly running out of room! I'm not totally sure what happened (well, actually I could guess... my belly has grown! ), but throughout this past week just about everyone I meet asks me when I am due. Every time I go to the store the cashier asks and I can usually count on a few people throughout the store asking too. I could totally go for a venti pumpkin spice frapp from Starbucks - give me all the caffeine, please! But since a venti just isn't in the cards, I will have to settle for a tall. Now that the nursery is almost complete, the majority of the things left to do are pretty easy (install the car seat, pack my hospital bag, a final load of baby laundry, decorate the nursery, etc.)! I have been pretty productive over the past week... finished my preregistration at the hospital, did a load of baby swaddle laundry, assembled and registered all of our baby gear, purchased a good amount of nursing attire, and took inventory of what we have left that we need to buy for the babe's arrival! One of the things on my pre-baby bucket list is to build a decent stash of freezer meals. I absolutely love to bake, but when it comes to cooking, I'm not a fan... and throw a new baby into the mix and you've got yourself a recipe for Chick-fil-a five nights a week! And as much as a I love Chick-fil-A, I think I would be well served from a little bit more variety in my diet... which is the exact reason why these frozen dinners are key! This pesto chicken ravioli is so simple to put together and tastes delicious. It makes a ton of food, so you can certainly count on some tasty leftovers for lunches. To save time (and cut costs on ingredients!) I generally make three of these meals at a time... One meal to eat that night and two to freeze. With a second set of hands, I was able to make all three of the meals in about an hour... not too bad if you ask me!! 1. Combine all ingredients into a large bowl, stirring thoroughly. 2. Spray a 9x13 inch baking dish with non-stick spray. 3. Pour the ravioli mixture into the baking dish and top with grated Parmesan cheese. 4. Cover with foil and bake for 1 hour at 350 degrees. 1. Combine all ingredients into a disposable baking pan. 2. Wrap the baking dish in airtight foil, plastic wrap, or freezer paper... and freeze! 3. When you're ready to eat, thaw in the refrigerator, and as directed above. For more freezer meal tips, you can check out my post here! Any freezer meals that you recommend?! I'm looking for more and would love some recommendations!